My husband doesn’t carry a wallet. He hasn’t for years. Instead, he keeps his cash and credit cards in a Money Clamp which he keeps in his front pants pocket at all times. He wouldn’t dream of using a “standard” money clip — because he says they aren’t nearly as sophisticated as the Money Clamp is. The official Money Clamp is similar to a traditional money clip, yet it’s very different. Jim just got his 3rd Money Clamp (…in 11 years). The first one was from back in the day when QVC used to sell mostly things that couldn’t be found in stores. This neato money clip they were showcasing was just different enough to catch my attention, and it seemed like it would make a great gift for my hubby. Several years later, his Money Clamp started looking a bit worn from being used day in and day out — so I got him another one that I found online. That one, too, lasted several years and it wasn’t until recently that I noticed that the official Money Clamp is now available on Amazon, so I grabbed a shiny new one for him. Truth be told, neither of his previous Money Clamps broke or failed in any way. The metal clamp had simply became scuffed after so much use, and the leather credit card holder was looking a little worn around the edges. I still keep his first two Money Clamps as backups in case of an emergency — should he lose his or something. It’s simple to use. You don’t have to dig deep inside of anything (like a multi-fold wallet) to get to your individual credit cards or dollar bills. It removes the wallet bulge that 95% of men have in their rear pockets. In effect, it streamlines the size of your “wallet” to about 2 inches by 3 inches in size. It’s much sturdier than a traditional money clip. It’s a much more substantial piece. It never stretches out or loses its tight grip. It’s easy to eyeball the credit card you want or the denomination of bill that you’re after. Just grab & go! It helps you stay organized. With slots for up to 12 credit cards (the 3 slots on each side of the leather wallet hold 2 cards each), you only carry the ones you actually use the most. Yet 12 is much more than some money clips allow. You can keep your “business” credit cards on one side and your “personal” credit cards on the other side (of the leather slotted pouch). You can keep receipts and other things in the small center pocket found in the leather wallet itself. The clamp itself locks on tightly, so there’s no chance of anything falling out! Everything (cards, cash, receipts) stays securely clamped in place within the Money Clamp’s tight grip. A front pocket wallet like the Money Clamp is safer. No one’s going to pick-pocket a guy’s front pocket! It’s very sleek and stylish. Almost every time he pulls it out of his front pocket, people study it from afar. Many actually ask where he got it and how it likes it. Even though it’s easier to find traditional money clips in stores, try as I might, I haven’t been able to get him to switch. 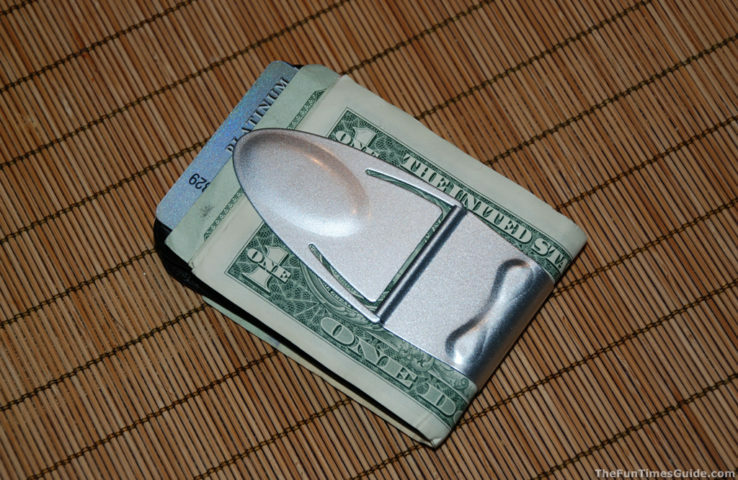 Not even to a slightly different type of money clip / wallet combo that seemed a bit more practical to me. Nope. For the past 11 years, the Money Clamp is the only thing Jim has used to safeguard his money and credit cards on the go! There are lots of different styles of the Money Clamp. Jim likes the Geneva the best — in silver.